The spider's retreat is in a spine cluster on an Engelmann Prickly-Pear (Opuntia engelmannii) at Mesquite Wash, Maricopa Co., Arizona, USA. 28 July 2012. The spider is about 3 mm. 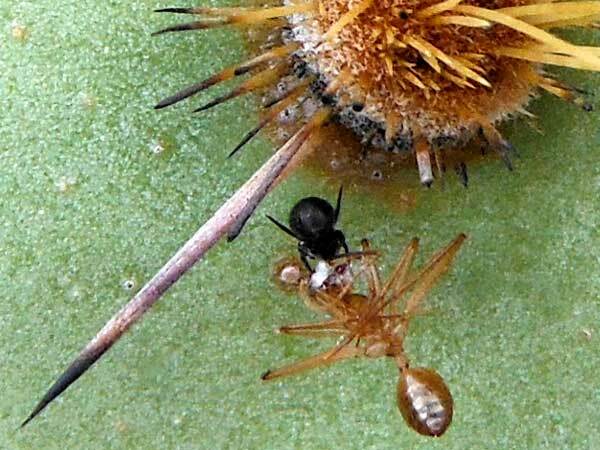 The ant in the photo is a minor worker of a Carpenter Ant (Camponotus festinatus), a nocturnal predator that was snared by the spider as it was foraging on the cactus for its own prey. Camponotus ants are normally very well defended with their formic acid spray and sharp mandibles. Predator-prey dynamics on every desert plant are influenced by many factors intrinsic to the plant and the biology of all the arthropods, birds, reptiles and even other plants living in and around the plant. Theridiid spiders have at least two characteristics that permit them to frequently take large, powerful prey. First, their silk tends to be very sticky and very strong. Second, many theridiids have potent venom that quickly disables the insect from struggling free.